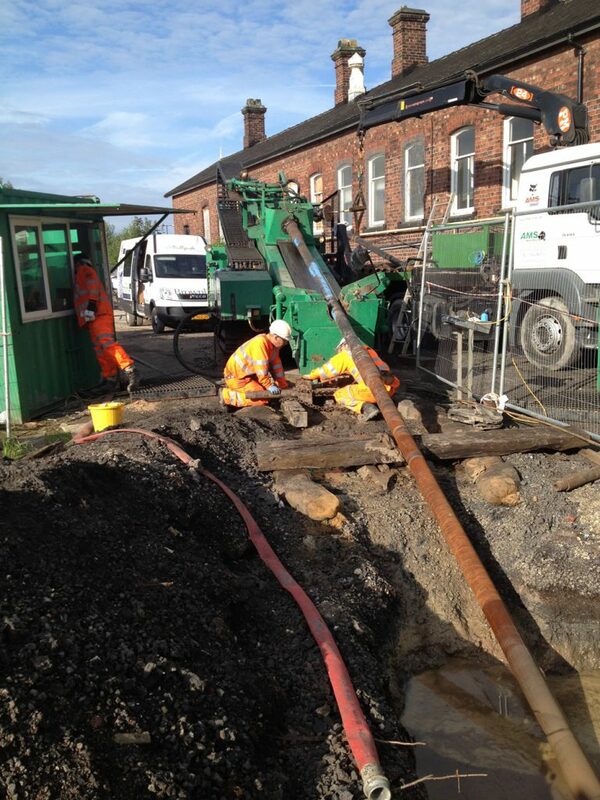 Drilling Contractor AMS No Dig from Scunthorpe, North Lincolnshire, UK was commissioned by Network Rail through Global Rail Construction to design and build a project to replace electricity cables as part of the Selby Swing Bridge Interlocking Renewal scheme. 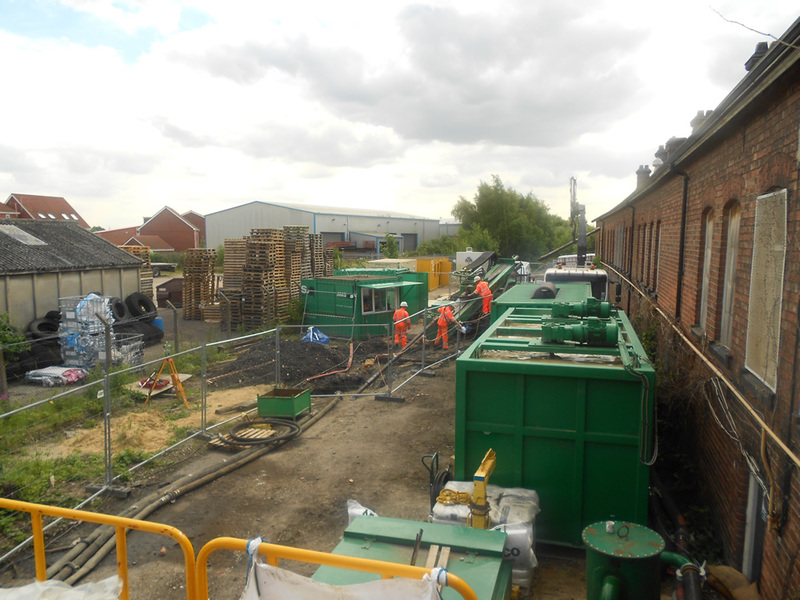 The works consisted of a HDD installation under a grade 2 listed building, Ouse Road ,the River Ouse, and the main railway line in the town centre of Selby, North Yorkshire, UK. The project faced some difficult challenges from the start. Due to land access and easement issues the requirement was to design a complicated three radius horizontal plan, this involved a 32 degree left turn followed by a 12 degree turn to the right with a combination radius of 225m. What is meant by combination radius? This is the combination radius of the drill string changing direction vertically and horizontally at the same time, this project had a 475m vertical radius and 250m Horizontal radius to ensure that once installed, the cables would be located within agreed land boundaries. 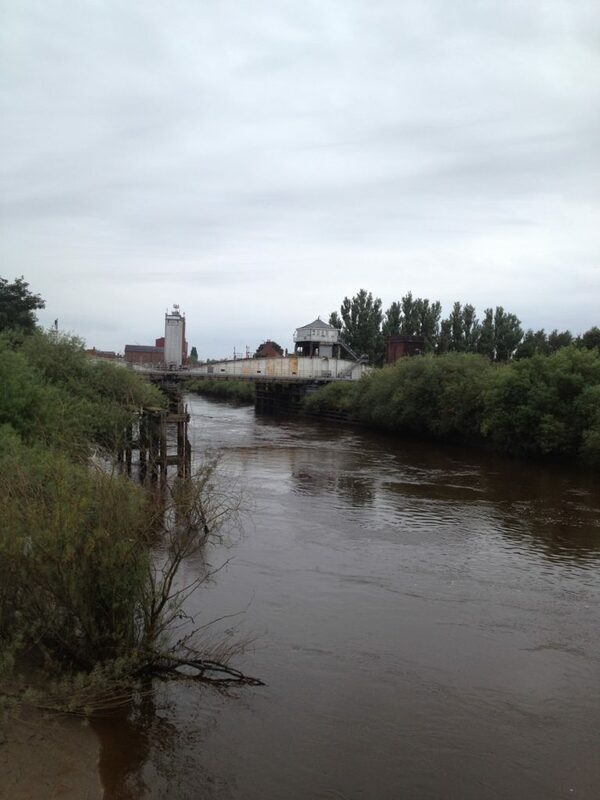 In addition to the drill passing under listed buildings, a road and river parallel to a metallic railway swing bridge, it also passed beneath a sheet piled flood defence and under the railway lines, all areas of very high magnetic interference. AMS No Dig Ltd worked closely with SlimDril International to provide the most cost effective and technically sound engineering solution to steer the pilot and given the lack of area to lay out surface coils and beacons, and given the large amount of magnetic interference present, the Brownline DrillGuide GST system was deemed the best steering tool for the job, as traditional wireline steering tools would not be suitable for such an application. The DrillGuide GST is an optical gyro tool that does not require any surface wire grids and is not affected by any external magnetic interference. The tool does not require to be housed inside a non-magnetic drill collar and therefore can be positioned nearer to the drill bit, giving accurate hole data as soon as possible. The accuracy of the GST tool is 0.04 degrees on azimuth and 0.02 degrees on inclination. Network Rail maintained a close monitoring regime throughout, and as there was very little tolerance for the steering engineer to work to, this called for careful project planning and attention to detail to ensure the pilot hit the many critical tangent points along the route, including providing enough space for future planned piling works. 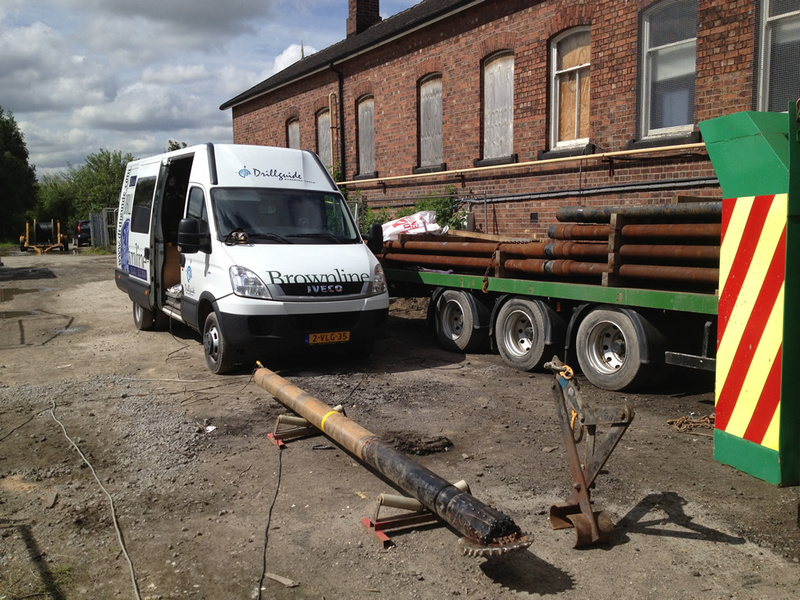 The project commenced on 13th July 2012 using a standard jetting assembly but unforeseen ground conditions encountered after just 20m meant that one of SlimDrils 6 ” 7-8 Lobe 3 stage mud motors had to be quickly dispatched from their Great Yarmouth base over the weekend to minimise downtime. The motor was fitted with a 9.7/8″ sealed bearing milled tooth bit (IADC 1-1-7) which was run in hole to drill the harder formation. Once the hard section had been negotiated, the motor was tripped out and exchanged for the softer formation jetting assembly to enable steering through the remaining soft formation to the exit point. Reaming was carried out over a five day period using a combination of fly cutters, barrel reamers and fluted rock reamers. Initially a 508mm fly cutter and barrel reamer combination was used to ream from chainage 300m to chainage 80m which consisted of stiff clays down to 7m below ground level (bgl) followed by sand and silt down to hole bottom at 21m bgl. The reamer was then tripped out of the hole and exchanged for a rock reamer which was used to ream the harder rock section situated between chainage 80m and chainage 20m. Due to the limited space available at the drilling compound and with the requirement to run 5″ drill pipe to satisfy the criteria set by the steering tool insurer, AMS opted to use the Powerbore 70t. The rig is very compact at 10m x 2.2m and when considering it offers 70 tonnes of thrust and pullback it proved to be the ideal choice for this application. In total 100cu of fluid adhered cuttings was removed from the hole. 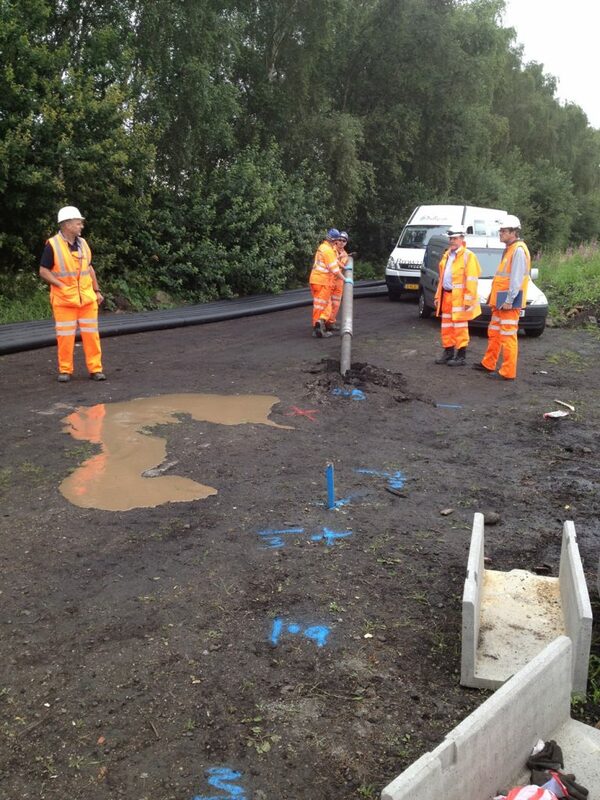 This was processed using one of AMS No-Dig’s bespoke mud management systems. The innovative modular design consists of an 18,000 litre mixing tank, a mud cleaning system and two 26,000 litre storage tanks. This arrangement provided optimum flexibility in terms of both site planning, as dictated by circumstances on the ground, and operational requirements, as dictated by conditions encountered under the ground. The high performance Derrick recycling unit has been designed to process 3000 litres of high viscosity drilling fluid per minute and comprises two Derrick Equipment FLC-504 shale shakers for primary screening and a Derrick FLC-504 mud cleaner, complete with 3 x 10″ de-sander cones and 20 x 4″ de-silter cones, for de-sanding and de-silting. The Derrick 504 units are mounted on a 24ft base tank which incorporates integrated centrifugal pumps to feed the de-sander and de-silter cones. Screening is carried out using the revolutionary pyramid screening system which ensures consistent cleaning down to 20um. The two 20 foot holding tanks include strategically placed agitators to ensure quality and flow of clean mud is maintained to the drilling rig, even when the 1500l mud pump is working to capacity. The entire plant can be mobilised and made operational within hours of arrival on site, helping to eliminate the long lead times usually associated with installing a liquid mud plant.